* Note: this track is not available for free download due to the fact that it is part of the licensed American Pixels" album. The project is available through Bandcamp, iTunes, Spotify, Google Play, Deezer, and Amazon. 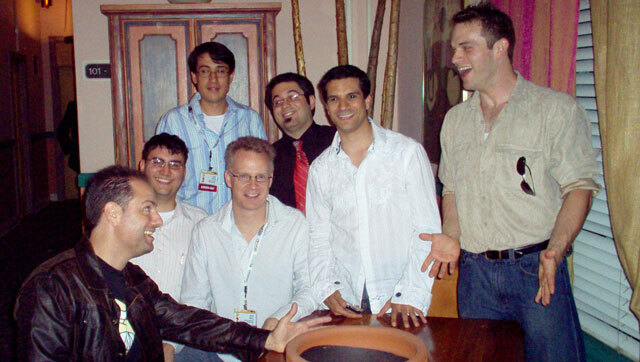 Left to right: Gerard Marino, Mustin, Dale North, Jack Wall, Jayson Napolitano, Tommy Tallarico, and me, Mazedude. After this meeting, I matched up with Gerard, and he shared with me if that I were to remix one of his tracks, he'd love to hear the "Sisters of Fate" theme from God of War 2 re-imagined. So I checked out the track, and held onto it for later. Fast-forward to development of American Pixels, and I reached out to Gerard again to confirm that he still wanted to hear a God of War 2 remix for his tribute, and well, he surprised me. He said that instead, he'd prefer to hear an arrangement from the latest project, DC Universe Online. And, I was provided with a collection of music to choose from. My first impulse was to target one of the Gotham tracks. Dark, somber, something that could be turned into a nice groove or a chillout piece... and then I had to catch myself. I already had Batman on the album (oddly enough), and there were enough minor key pieces... and, I had yet to make something that sounded truly patriotic, which was something of a requirement for me given the theme of the album. So I switched gears and instead targeted a piece known in the files as "Metropolis Hero Intro." It was epic, positive, and had a hint of Americana to the theme. I could totally picture Superman standing in front of an American flag. Again—which seems to be a recoccuring theme with this album—it was full orchestra, and I had to arrange it somehow with my humble tools. After some thought, the idea was formed to bring this back down to a sense of hometown Americana, featuring classical guitar. I envisioned a lone guitarist, just outside a military base, back against a tree, strumming a diddy while soldiers train in the distance. For the lead, I asked William Reyes of The OneUps to come play the solo, and he was more than happy to. It wasn't a very easy one either. And then of course, in true Mazedude fashion, electronics enter the scene, fusion occurs, etc. This was actually one of the more difficult pieces for me to make, considering it's a kind of a whole new genre I've crafted here, with a completely unique soundscape. Still, I'm pleased with the end result.